English people are well-known to be tea lovers as well as Asians, but what people don’t know is that tea is the most popular drink consumed in the world after water. 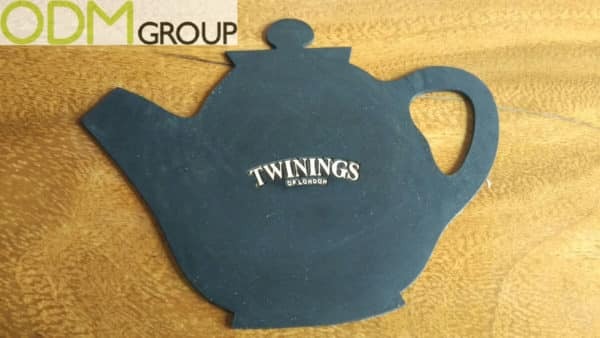 Here it comes an amazing marketing idea by Twinings. One of the world’s best-know tea brand is carrying out a promotional campaign in Philippines to enhance their brand value and gain more exposure. 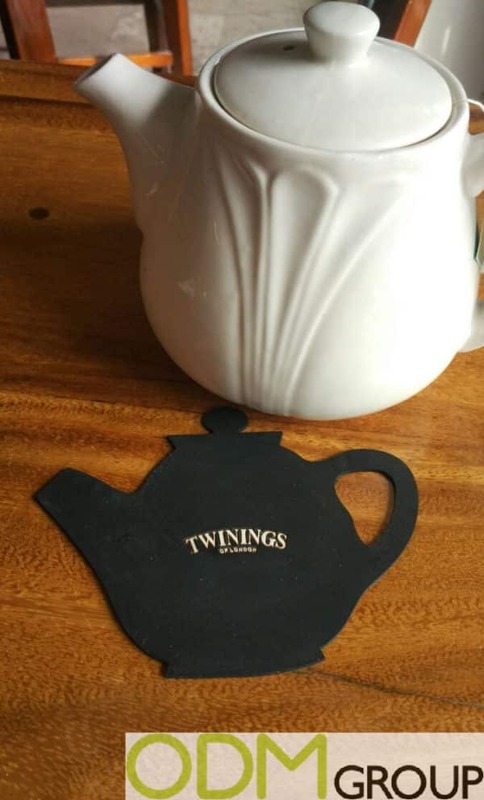 In a cake shop in Cebu, we pleasantly had the chance to enjoy some of the custom shape coasters by the English tea marketer. They are entirely made of durable silicone in a shape of an minimalistic and elegant teapot. This good quality materials product, allow good grip for holding drinks and at the same time protecting the finish of the wooden table from the heat and preventing water leaking. After the using they are easily washable thanks to the smooth surface. We are sure all the customers will love these soft cup pads. They are perfect to give a touch of class to the tea break and subliminally advertise. Why these custom shape coasters is a great idea? Increased perceived value: these coasters will probably be combined together with the tea or coffee brand your company produce, this adds an extra value that make your customers indirectly raise their perceived standard. Raise brand awareness: coasters are very convenient promo items, they can be used at home, in office, in pubs or exhibited in stores. This makes plenty of opportunities for your coaster to be shown off. Expanding product range: if you are a drinks company, these custom shape coasters would be a perfect marketing idea in pubs but also as a promo item to add to a new product line to expand your articles range. To make it more appealing and suitable for your brand we can offer you some adjustments as different colours, shapes, sizes, add a higher boarder and so on. If you are interested, please do not hesitate to contact us. We will provide you with our quality sourcing, designing and manufacturing services necessary to help you in your next promotional campaign. We would also like to suggest you other promotional strategies as POS displays, on pack promotions, gift with purchase and in-store displays.